101 Quickie SoupsIndian-Spiced Cauliflower Soup with Hard Boiled Eggs10 Techniques for Making Quickie SoupsQuick Soups, Fully – Our Free Soup Ebook! Who’s addicted to kale? 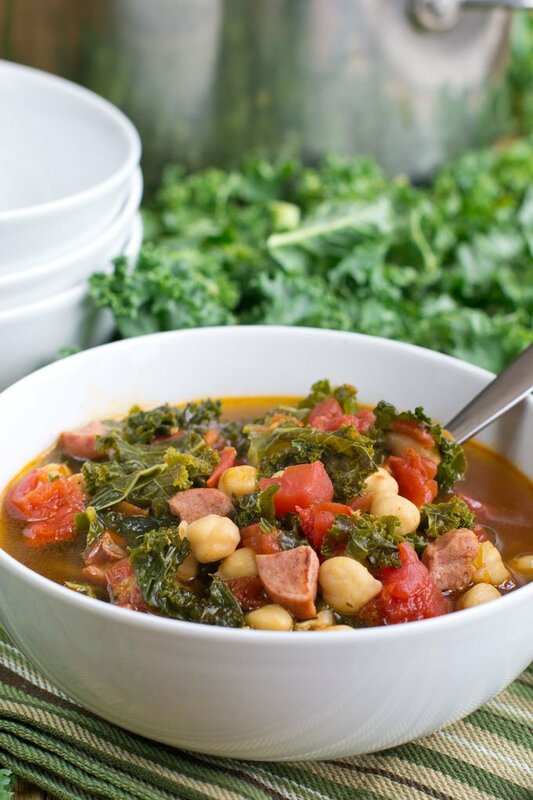 Feed your addiction with this chunky Kale and Kielbasa soup, perfect with a cozy blanket and a night of reruns. The world has gone kale crazy. Have you seen all the different recipes for Kale Chips and Kale Juices? Ha ha! I’ve even seen Kale Chocolate Chip Cookies. Yes, really. Thanks, but no thanks. I prefer my kale in hearty savory dishes. 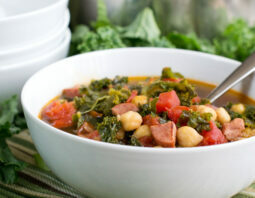 This Kale and Kielbasa Soup is totally one of those. Kale is a pretty simple ingredient to work with. You can buy it as whole leaves or pre-chopped in plastic salad bags. If you get the whole leaves, you’ll need to remove and throw out the hard thick stem. Just tear or cut the soft leafy parts off of the stem and then chop them up. You’re good to go. It’s easier though to get the bagged kale. It’s pre-washed and pre-chopped, cutting way down on your prep time. A quick prep time is what it’s all about when making quick soups like this. It’ll be ready in under 15 minutes. Dinner is served! Put a large pot or Dutch oven over medium- high heat and add the olive oil. Measure the broth into a microwave-safe bowl and put it in the microwave for 4 minutes. Put the kale into the pot with the olive oil along with the salt and pepper. Stir and cover. Chop the kielbasa into 1/2 inch pieces. Add it to the kale. Stir and cover. Stir occasionally. If the kielbasa starts to darken, reduce the heat to low. Mince the garlic. Add it and the chili powder to the kale. Stir. Add the hot broth from the microwave. Stir. Cover and cook on high until simmering. Open the diced tomatoes and add them to the pot. Open the chickpeas. Strain them and add them to the pot. Bring it up to a simmer over high heat. Reduce heat to low and continue to cook until the kale is more tender, 4-5 more minutes. Published September 2015, revised January 2016.